Lisa Lombardo 01/31/2019 02/19/2019 22 Comments on Hatching Chicks vs Ordering: Which Is Best? Enter Promo Code SelfSufficient to save on qualifying orders. Hatching chicks, ordering them from a hatchery, or buying them from a farm supply store is a fun activity for homesteading families. But which option is best? Some swear by hatching their own, while others can’t resist the little fluff balls at their feed store. And a quick search for poultry hatcheries will surely complicate matters when you see the numerous breeds available online! In this article we’ll discuss your options for adding chickens and other poultry to your homestead, plus the pros and cons of each. For a week or so before you wish to hatch your farm fresh eggs, check each egg that you crack open to cook. Look for a blastodisc or blastoderm. 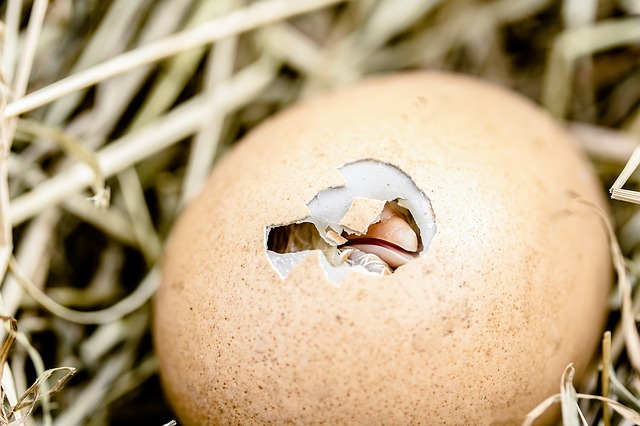 If most of the eggs you crack open have a blastoderm, you will know that your hens are laying fertile eggs. Even if you don’t have a flock of chickens or a rooster, you may order fertile eggs online. This can be costly and the shipping process may jostle eggs and reduce successful hatch rates. Order extra eggs in case some don’t hatch and try to order when weather conditions are mild. You may also check on your local Craigslist under the Farm section (be very careful picking up from Craigslist…follow safety precautions and bring a friend). Eggs should be kept between 50 and 70 degrees Fahrenheit with humidity levels around 75% for storage until hatching. They should be set under a broody hen or into an incubator within 7 to 10 days of laying, for best hatch rates. Order chicken feed from Azure Standard! It is fun and educational! If you have hens that go broody, you can let them do the work for you and hatch the next generation. Not all hens will go broody and some are not reliable about setting for the full 21 days or rearing their young. Some breeds are more likely to go broody than others. 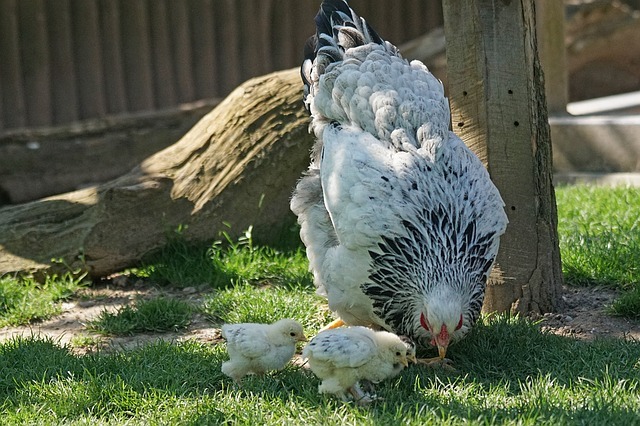 Many breeds of chicken have had their maternal instincts bred out to increase their egg laying capacity. On the other hand, some hens have such strong broody traits that they’ll try to hatch a rock! They will readily accept fertile eggs from another hen, or even another species of poultry. 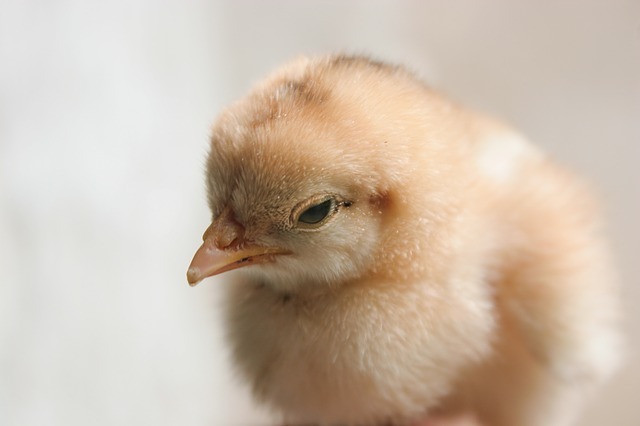 If you don’t have a broody hen, you will need an incubator to hatch eggs at home. 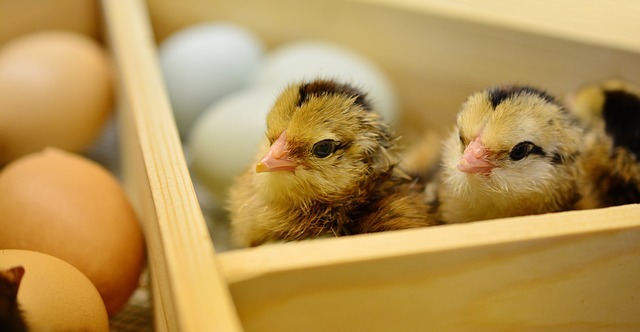 A good incubator will have a turner, temperature control, and humidity trays to provide the ideal conditions for hatching. Some basic incubators need much more attention on your part, including turning the eggs 3 to 5 times a day, and checking the humidity trays and temperature regularly. If you are just starting out with poultry or you would like new breeds or species, you may want to order from a hatchery. There are many breeds of chickens and other poultry available when you order from a hatchery. You may choose to expedite shipping so your chicks arrive in less than 3 days to give them the best start in life. This will involve an additional fee. Most hatcheries guarantee 3 day shipping, although there is the occasional delay. Chicks are born with a 3 day supply of nutrition left from the yolk, which allows for the common practice of shipping day old poultry. Choose a reputable, pullorum free hatchery that is in your region to ensure you receive healthy chicks that arrive quickly. 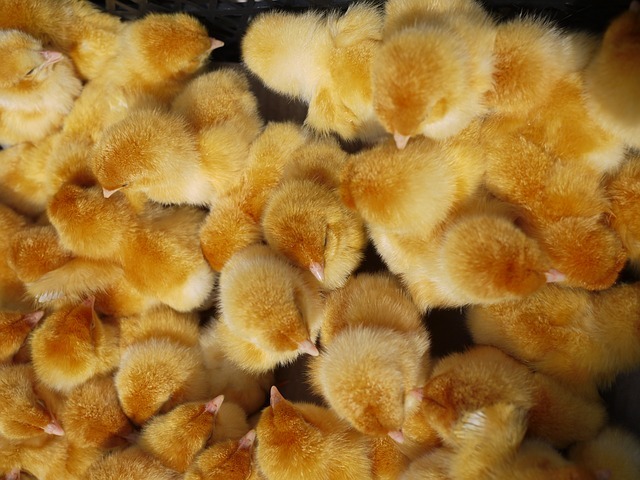 Many farm supply outlets and feed stores order in chicks each spring for ‘off the shelf’ sales. These chicks often sell quickly as an impulse item. It isn’t advisable to pick up chicks from the feed store just because they are cute and happen to ‘jump’ into your cart! You’ll want to be prepared for them before you bring them home. What Is The Best Way To Get New Chicks? Of course, there is ‘no one size fits all’ answer to this question! If you don’t have chickens and you want to start a new flock, you will need to acquire fertile eggs and hatch them yourself, purchase them at your feed store, or order them from a hatchery. If you already have chickens, you can bring in new chicks to try a different breed, or you can hatch fertile eggs from your own flock. You’ll need to keep a rooster to have fertile eggs and some people prefer not to do this, or are prohibited from keeping roosters in their area. In that case you’ll need to buy chicks or fertile eggs to increase the size of your flock or replace old laying hens. Choose the method that works best for your homestead and have fun raising your chicks! Thank you! Have been considering this recently, and as much as we would love to hatch our own, probably the best choice for us at this time is buying. The information is great, as always! Will save for the future. I’m glad that it was helpful to read this. Hatching is a lot of fun, but it can also be very demanding! Have fun picking out chicks! In the past, we’ve added to our flock two ways. The first was picking up chicks at the feed store and nurturing them in the basement under heat lamps until they could move to the yard and learn the ways of the world. The second was when we culled some of our meat birds to move into the egg flock. They were NH and RI Reds and have worked beautifully so far. Their laying is almost as impressive as our old ISA Browns. We have talked about letting as broody hen try her hand at a natural lay, so if one of our current ladies decide that’s what they want todo, we’ll let it happen. Your note about moving her to a different coop was good info, and we all be sure to do that. 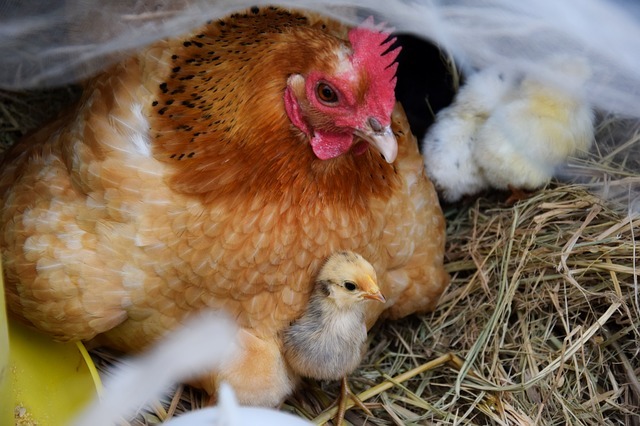 I share some tips for helping your broody hen have a successful hatch…hope this helps! Very good details. I love the idea of hatching your own chicks. Another reason to hatch your own, is if you get involved in showing poultry. All three of my daughters were involved in 4-H showing poultry from 1st grade right up through high school. It was a wonderful experience for them to try and improve their chosen breeds to the written standard for that breed. Showing poultry is not very popular, and many people don’t even know about it! But just like there are standards written for dogs by the AKC for the Golden Retriever or the Basset Hound, their are standards written for not only each chicken breed but also for their variety (ie: color and/or feather pattern), by the American Poultry Association in the Standard of Perfection book. Lisa, Thank you for this article. We cannot have farm animals on this rental homestead but I for sure want chickens when we move onto our forever homestead. Your information helps me a lot. I always seem to be at the feed stores when the baby chicks are there and I really want to be a good chicken mama. Your information is a great learning one for folks like me who are wanting chickens but need to learn beforehand. Thanks! Thank you for your kind words, Jennifer. I hope you can have chickens soon! I had to wait for quite a few years before we could move to our homestead. Now I have trouble imagining life without them. Best wishes! Awesome information! We recently ordered eggs and did a small hatch in an incubator. I think next time we would like to try and order live chicks. Thanks for the information all in one article! Happy to share, Amy! Best wishes with your future chick order! Terrific information! I have not jumped into raising chicks in an incubator, but I have had great luck with feed store chicks and mail order. I’m hoping to get chicks in the spring. Incubating eggs is fun and educational. 🙂 But you really do want to plan ahead and make sure to do it properly! Best wishes with your chicks this spring! Thank you for this, Lisa! This is going to be helpful for when I am ready to let my girls hatch their own chicks! I didn’t know about the blastoderm, I’ll be checking my eggs for those this week! Glad to help out 🙂 It is fun to check the eggs to see if they are fertile when you are getting ready to scramble a few. What a great post, so informative. We have not hatched any chicks yet. Usually we bought them from our local feed store and have always had good luck. I appreciate that you shared the pros and cons! Thank you, Nancy…It is always fun to see the chicks at the feed store. 🙂 I have hatched, ordered, and picked up at the feed store with pretty good results. 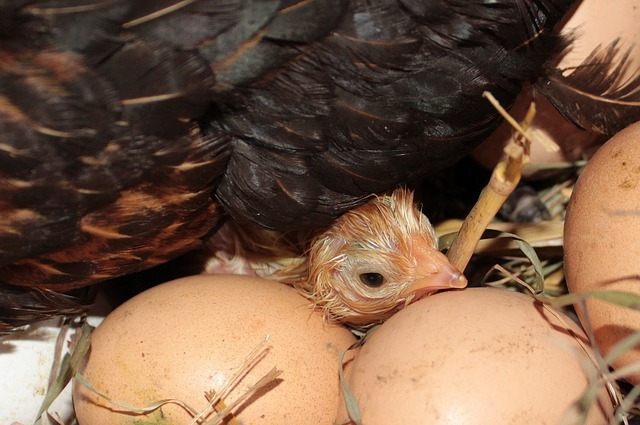 We have found that hatching chicken ourselves gives them a better head start in life. My rooster must be doing his duty I get maybe two unpatched eggs out of 20. I ordered our chicks or bought them at store for several years. We started hatching out our own and wow are they healthier, grow faster and all around much better. Found you on Simple Homestead Blog Hop. I would much prefer to hatch my own for those reasons, and for the economics too. This year I really need to order a new breed…so back to the hatchery!